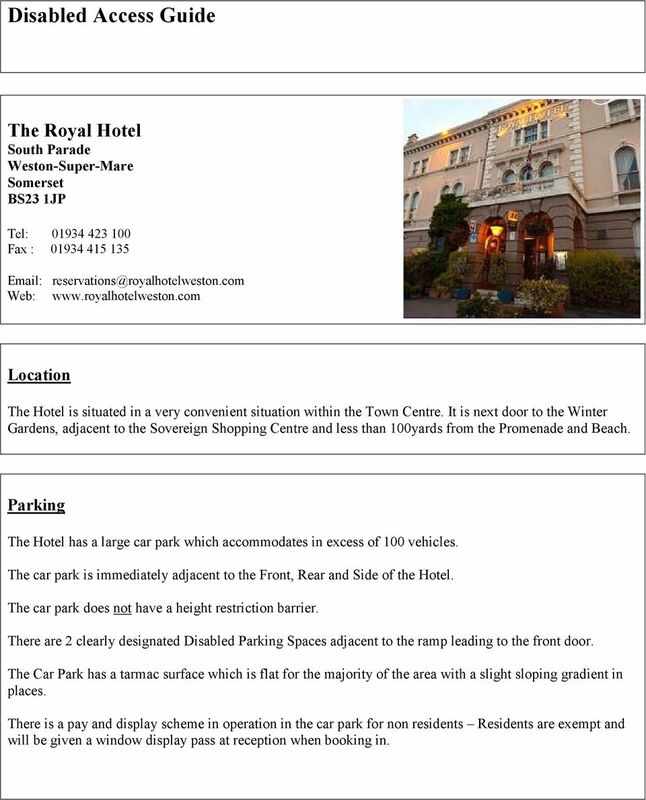 1 Disabled Access Guide The Royal Hotel South Parade Weston-Super-Mare Somerset BS23 1JP Tel: Fax : Web: Location The Hotel is situated in a very convenient situation within the Town Centre. It is next door to the Winter Gardens, adjacent to the Sovereign Shopping Centre and less than 100yards from the Promenade and Beach. Parking The Hotel has a large car park which accommodates in excess of 100 vehicles. The car park is immediately adjacent to the Front, Rear and Side of the Hotel. The car park does not have a height restriction barrier. There are 2 clearly designated Disabled Parking Spaces adjacent to the ramp leading to the front door. The Car Park has a tarmac surface which is flat for the majority of the area with a slight sloping gradient in places. There is a pay and display scheme in operation in the car park for non residents Residents are exempt and will be given a window display pass at reception when booking in. 3 Lift There is a lift for Public use accessed by corridor through the Restaurant. 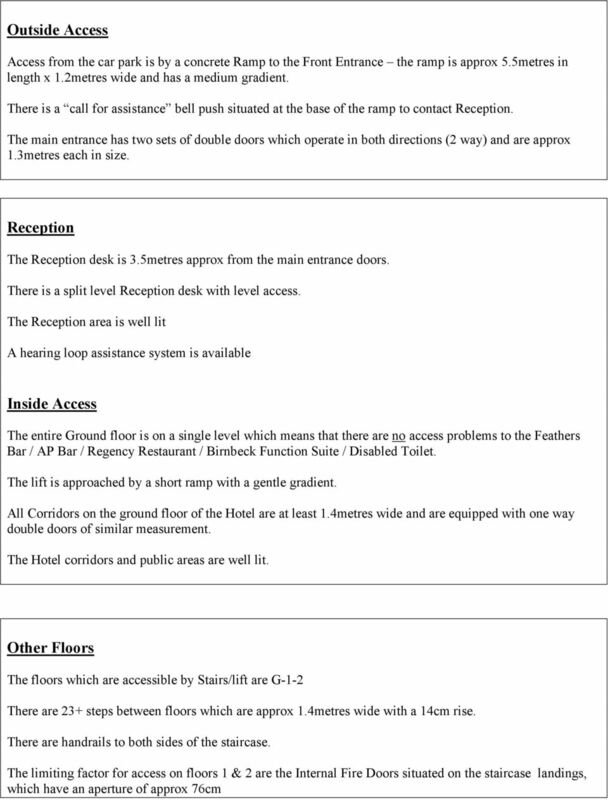 The lift has been fully equipped to Disabled Friendly standard. The internal dimensions of the lift are 150cm x 110cm approx. There is a mirror too aid reversing out of the lift The Lift is well lit The lift does have an audible announcer The lift does have tactile markings Toilets There are standard Male and Female toilets designated for Public use situated in both the main Reception area and also in the Birnbeck Suite. Adapted Toilets Adapted toilet facilities are available and are conveniently situated adjacent to Reception / Feathers Bar / Restaurant. 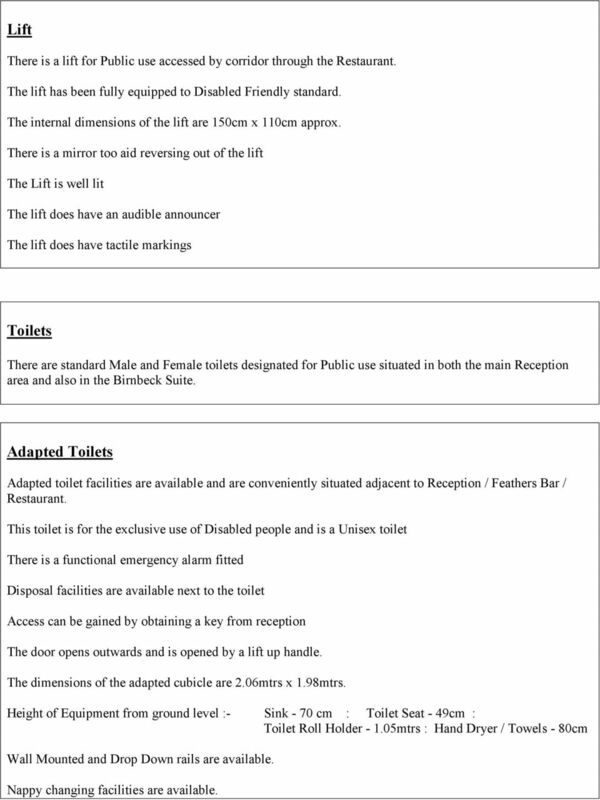 This toilet is for the exclusive use of Disabled people and is a Unisex toilet There is a functional emergency alarm fitted Disposal facilities are available next to the toilet Access can be gained by obtaining a key from reception The door opens outwards and is opened by a lift up handle. The dimensions of the adapted cubicle are 2.06mtrs x 1.98mtrs. Height of Equipment from ground level :- Sink - 70 cm : Toilet Seat - 49cm : Toilet Roll Holder mtrs : Hand Dryer / Towels - 80cm Wall Mounted and Drop Down rails are available. Nappy changing facilities are available. 4 Restaurant / Bars Food and /or drinks can be brought to the table. There is ample room for a wheelchair user to manoeuvre No Tables or Chairs are permanently fixed There are 66cm between the floor and the lowest of the dining tables Menus are not available in Braille Menus are available in large print Rooms There are 37 letting rooms in total situated on floors 1 & 2 of the Hotel The Fire escape is no further than 30metres from any of the rooms. 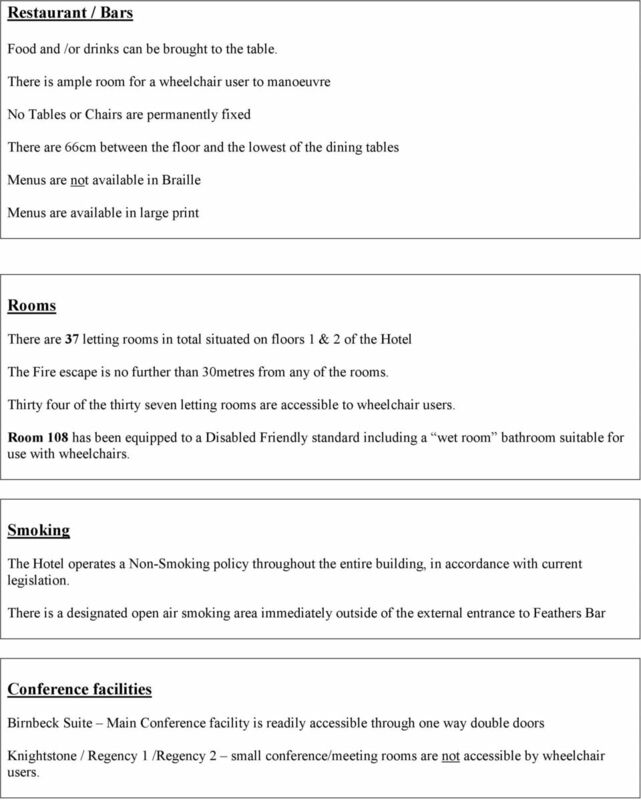 Thirty four of the thirty seven letting rooms are accessible to wheelchair users. Room 108 has been equipped to a Disabled Friendly standard including a wet room bathroom suitable for use with wheelchairs. Smoking The Hotel operates a Non-Smoking policy throughout the entire building, in accordance with current legislation. There is a designated open air smoking area immediately outside of the external entrance to Feathers Bar Conference facilities Birnbeck Suite Main Conference facility is readily accessible through one way double doors Knightstone / Regency 1 /Regency 2 small conference/meeting rooms are not accessible by wheelchair users. THE UNIVERSITY OF EDINBURGH. 16 Buccleuch Place. Time to upgrade your facilities? Restaurant and Café Risk Management Guide. Don t Risk It! Residential SALES. 71 Oxhey Lane, Hatch End, Pinner, Greater London, HA5 4AY. pulvercarr.co. 0 2 0 8 4 2 1 0 1 0 7 pulvercarr.co. Licensed Premises Warmington Oundle A licensed, former club premises available immediately. Located within a well serviced and attractive village just off the A605. Includes owner s three bedroom accommodation.